The advent of digital technology has revolutionised self-publishing. For most indie authors, digital self-publishing is now the mainstay of their writing career. Remember, digital self-publishing doesn’t just mean producing ebooks. It also includes print-on-demand printing, the first choice of indie authors around the world. Back in the late 19th century, when publishers in the US and UK divided up the copyright world, book rights were tightly controlled within geographic areas. A book published in the US, for example, was not freely for sale in the UK or Australia. Now POD books, ebooks, books as apps, and online bookstores are changing all that. You press “publish” today in Canada, and you can be read in Japan tomorrow. This greatly increases the potential readership for a title that might have struggled to sell enough numbers at national level. Thus, many niche markets and more literary and mid-list writers can now flourish. An indie author can receive as much as a 70 percent royalty from an ebook self-published with Amazon, iBooks, or Kobo, compared with 10 percent or less from a book sold through trade-publishing. In the old way, a reader read about a book in the review pages, or heard about it on the radio, or was recommended it by a friend. They wrote down the author and title and went to the bookstore and asked for it, and maybe it was in stock. Now a reader can buy your book online at the moment they discover they want it. It can be theirs at – literally – the touch of a button in that ital instant known by salespeople as the “desire-to-act” moment. There’s no such thing as “out of print” with digital and no such thing as “returns”. In the old publishing system, most new books got a few weeks around publication time to make their name. Now, indie authors are like Bob Dylan, on a never-ending tour There’s no reason why you can’t be promoting in 20 years’ time a book you publish today, if you want. In trade-publishing, authors have no control over the pricing of their books. In indie self-publishing, the ability to manipulate price at the touch of a button, and to give away free books, delivers a competitive advantage. Trade print publishing takes months, or sometimes years, to fix errors. Publishers print revisions only after a print run has sold. All the major self-publishing services allow you to revise your book whenever you want, in both ebook and POD versions. Aside from exceptional bulk sales, trade-publishing sells to retailers, not readers. A self-publisher can make any kind of deal with any group or organization and set up any collaborations and partnerships that suit them and their books. In the trade system, an author gets a six-monthly or yearly royalty statement that is often complex and incomprehensible. Ask a trade author how many copies a book has sold, and the answer will probably be that they don’t actually know. Online ebook and POD sellers provide near real-time sales figures, so you can get immediate insights into the usefulness of marketing and promotion efforts, or experiments with pricing. Amazon’s Author Central also provides access to BookScan, which delivers point-of-sale retail information for print books. A lot of editors, proofreaders, designers, and other pros have gone into the freelance marketplace, and many indie authors are now hiring editors who used to be employed by large publishing houses. New technologies make publishing easier and cheaper all the time. so every talent and tool you need to build a wonderful book is now available to you, at a reasonable price. In the old trade-publishing system, only the most successful celebrity authors had control of, or even input into, matters of design and title or, sometimes, even subject matter and treatment. As a self-publisher, you decide what’s going to be in your book, how long it will be, how it will look, what it will be called. that level of control and responsibility is an exhilarating, sometimes scary, experience. This creative freedom, together with new technologies, is giving rise to new literary forms: books as apps, Kindle Singles, novellas, multimedia books, books as online courses, cell-phone novels, and many more. and one of the least discussed benefits of ebooks – hidden away beneath chatter about their effect on publishers’ bottom lines – is that they allow stories to be exactly as long as they want to be. And it seems many of them want to be between 10,000 and 35,000 words long. This has the makings of a whole new genre in both fiction and non-fiction. Taken together, these changes are remaking authorship. Self-publishing now offers real creative and commercial opportunities. 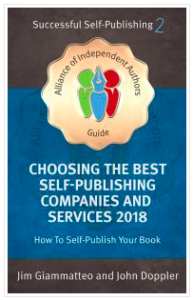 To build a clear understanding of how the self-publishing market operates, and to help you find your way successfully through the mass of service providers out there vying for your business, read the ALLi Guidebook Choosing the Best Self-publishing Companies and Services 2018 – How to Self-publish Your Book, by our Watchdogs Jim Giammatteo and John Doppler. Note: Although ALLi recommends digital self-publishing for the vast majority of self-published books, projects requiring special effects such as embossed covers or printed endpapers will require offset litho. See this post by Print2Demand for more insight into that idea. Thank you for all of these very sound bullet points for ebooks, along with pointing the finger toward potential resources for marketing them!